Australian guitarist Stu Marshall (Dungeon, PainDivision) never does anything half way. 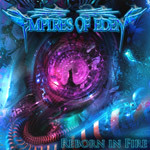 His debut Empires of Eden project was a tour-de-force of very strong melodic/power metal. Marshall returns with his sophomore title, Reborn in Fire, another mammoth slab of colossal melodic heavy metal featuring his searing fret fireworks. Marshall's fingerprints are all over this album: it's his pure passion and enthusiasm for his metal-craft that makes Reborn in Fire thrilling. Building upon the brilliance of the first platter, and his international cred, Marshall enlists several of the best metal vocalists of our day. Accompanying return collaborators Louie Gorgievski, Mike Zoias, and Chris Ninni are metal heavyweights Mike Vescara (Obsession, Loudness, Yngwie Malmsteen), Sean Peck (Cage), Zak Stevens (Savatage, Circle II Circle), Steve Grimmett (Grim Reaper, Onslaught, Lionsheart, GrimmStine), and Carlos Zema (Outworld). These stars alone could steal the show as they too have given the same passion in their performances as Mr. Marshall. A short list of favorites: Zak Stevens on Prognatus Ut Obscurum, Scott Peck on Total Devastation (the title describes his performance), and Zoias and Ninni on the stirring title track Reborn in Fire. Yet, EOE is still a Stu Marshall project. His arrangements are epic, definitive examples of the genre, and his fret work soars from fundamental neo-classical to otherworldly inventiveness. He inspires on all tracks, but listen for his best on Of Light and Shadows, Death Machine, and Beyond Daybreak. While melodic power metal is an abused and often repetitious genre these days, Marshall and his Empires of Eden project resurrects and revitalizes it in a single crushing, head banging, 50 minutes. Strongly recommended. While drawing on some great metal vocalists, guitarist's Stu Marshall's fingerprints are all over this album. But it's his pure passion and enthusiasm for his metal-craft that makes Reborn in Fire thrilling.